Officials with the Texas Department of Corrections reject the notion that the recent addition of cooling fans that look transplanted straight from the sidelines of an NFL game are in response to numerous lawsuits and inmate deaths due to heat exposure. Yeah, right. The cooling equipment employs a large fan inside about a 6-foot-by-6-foot box. Water from a hose behind the $1,800 device flows over coils that cool the air pushed by the fan. Similar devices are used at athletic events, although those often blow a mist, too. The conditions in many Texas prisons has gotten absolutely cruel and intolerable. Some reports have even alleged triple digit heat within the common areas and cells of prisoners. 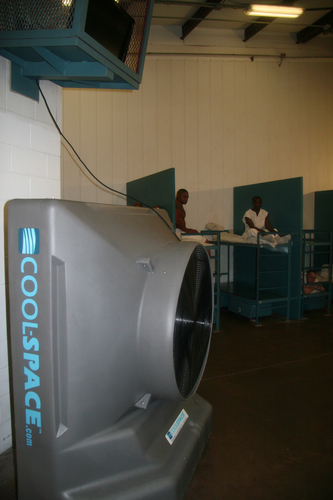 Installation of 28 Cool-Space evaporative coolers are “just something we thought we would try…This year we purchased close to 700 additional fans for offender housing and work areas,” one official noted. The heat is real – the danger is real – and so are the ensuing wrongful death lawsuits. Some of the lawsuits are families who say their loved ones died behind bars because of high temperatures. There are eight wrongful death lawsuits pending and a class action lawsuit pending. To suggest this is just a coincidence belies the facts. Only after the deaths, numerous op-ed pieces and investigative reports, and the instiution of these suits were changes like this made. Prison officials won’t address the allegations in the lawsuits, saying they don’t comment on pending litigation. Texas is not alone in torturing its prisoners with intolerable heat. There is a case from New York where a mentally ill homeless veteran died in February in a 100-degree Rikers Island jail cell. In that instance the heat came from a malfunctioning air unit. A report issued last month by the University of Texas School of Law’s Human Rights Clinic found that at least 14 inmates have died from exposure to extreme heat since 2007 in Texas lockups. Just last week, a federal civil rights lawsuit was filed on behalf of four Texas inmates who contend their health issues are exacerbated by the heat, including an allegation they sleep on concrete floors because their metal bunks are too hot. The suit includes allegations that heat is responsible for 20 prison deaths in Texas since 1998. Agency spokesman Jason Clark said the medical, psychiatric, education and geriatric areas of prisons are air conditioned, but a cost analysis hasn’t been conducted for installing air conditioning in all of Texas’ prisons — some of which are more than half a century old. “But I can tell you it would be extremely expensive to retrofit and air condition,” he said. LET’S GET THIS STRAIGHT – HUNTSVILLE INMATES ARE BEING CONFINED WITHOUT AC!? That’s right. Hence the fan’s. This is so absurd on its face that it is almost unbelievable that this has carried on so long without being fixed. If you’ve been accused of ANY CRIMINAL OFFENSE it is critical that you have an aggressive criminal defense attorney in your corner. You need someone that will fight for your rights and will put the state to their burden. Contact attorney Tristan LeGrande IMMEDIATELY by calling 281-684-3500.